Excessive noise from a neighbour can seriously damage the quality of home life, causing stress, irritation and sleep disturbance, but what is the best way to achieve a positive resolution? Neighbour noise can take many different forms. It could be the thumping bass of a stereo or TV, incessant shrieks of an unruly child, the reverberating stomp of heavy feet, the hammering sounds of a DIY enthusiast - the list goes on and on. However, whatever the cause, if the noise is so loud and frequent that you can’t go about your day to day life as normal – such as being woken in the night, or unable to hear your own TV – then you need to take action. However, as good neighbourly relations are crucial to a happy home life, action should be taken with care and sensitivity to avoid making the situation worse. The best way to achieve this is to address the issue face to face with your neighbour. The neighbour should be given chance to solve the problem. Many noise complaints are resolved amicably at the first step. Often the neighbour is unaware of the disturbance they are creating and feel guilty about causing any distress. For the best chance of a harmonious resolution it is important to plan your approach beforehand and to choose the right moment. For instance, it is a bad idea to go around when you are feeling angry, or when the noise is actually happening, such as if there’s a party going on. However, you may find your neighbour unsympathetic to your complaints regardless of the moment. Your next step could be to write a letter informing your neighbour they are causing a problem, what it is and what you want them to do about it. This method might be employed as a first move if you don’t want to approach them, for example if you are worried they may respond with violence. It is vital that you keep a copy of the letter. If you take up the complaint formally, this will serve as proof that you have attempted to tackle the problem yourself. If the neighbour rents their home and direct communication has proven fruitless then it is worth speaking to their landlord. This may have an effect because the neighbour could be breaking the terms of their tenancy contract by causing a disturbance. The landlord might be able to sort out the problem or at least threaten the tenant with eviction if they continue to cause a nuisance. How long the noise lasts. The effect it has on you. Names of other people who have heard it. It is of course difficult to ascertain how loud a particular noise is. For help with this, the Noise Abatement Society provides information about different types of noise levels. If the direct negotiation fails then you should then contact your local council. Their environmental health department has a statutory duty to take reasonable steps to investigate complaints and has the power to deal with them. A noise complaint may lead to an environmental health officer visiting your home to monitor the noise. They might even install noise monitoring equipment to measure the noise level over a period of time. If the environmental health department deem the problem to be a serious one then they will take appropriate action. This might include mediation, a warning letter or an abatement order. However, what happens if the health officer doesn’t agree with your complaint? As there is no set level at which noise officially becomes a nuisance, their assessment depends on their judgement, and this can vary considerably from one council to the next. If you disagree with their assessment then there are few alternative options open. Firstly, you could try to get other neighbours to support your complaint to give it greater weight. Alternatively you could seek the help of the Local Government Ombudsman who are an independent free service with High Court dedicated to investigating complaints handled unsatisfactorily by local councils. You might also consider taking private action. However this step should not be taken lightly – first you should seek legal advice by going to a local advice centre or by talking to the clerk of the court. If your noise complaint with your neighbour leads to harassment then the police should be contacted because they might be committing a crime. @Stevoden - if you're selling your house and you have has a dispute (in the past) you have to list it.If you keep your mouth shut and the new buyer finds out there was a dispute and you never listed it, you could find yourself at the wrong end of a costly legal challenge. If you lie on the form, you're risking it. It's whether you think it's worth the risk. Hi, ive contacted my LA and had a warning letter sent out too my noisey neighbour. luckly the noise has gone down for 6 months but has started to creep back up again - I am giving in and moving out - as it has gone down and next door didnt recieve an abatement notice do I still have to declare the dispute even though its in the past? I am looking for some advice as I now feel desperate. I am a secure council tenant living next door to a private tenant, who rents from her father. The mother screams at her children practically on a daily basis. Some times what comes out of her mouth is vile. This then creates them to slam doors bang from upstairs throw things against the wall and punch walls. This has been going on for a very long time. My friend who lives with me suffers from mental health issues andunable to work at the moment has to endure this day in day out, to the point it is affecting her health. After the last episode it is now getting me down. They are unapproachable. What can I do with out fear of reprisals. Unfortunately, as we are UK-based site we can't advise on this as your laws will be very different. Is it legal? My neighbour is a care home. They ran their machines and made kitchen noises night and day which affected our sleep and enjoy the life at home.But the council replied they allowed them to have noises and they did not think these were nuisance.The Ombudsman agreed with the council because they are a care home. As our service is merely to give general advice and/or point people in the right direction, we couldn't comment upon whether the results of the ombudsman's findings were right or wrong. You would need to seek professional legal advice if you wish to take the matter further. Is it legal? My neighbour is a care home. They ran their machines and made kitchen noises night and day which affected our sleep and enjoy the life at home. But the council replied they allowed them to have noises and they did not think these were nuisance. The Ombudsman agreed with the council because they are a care home. Been living below an identical to mine 2 bed flat. The leaseholder traditionally rents out the flat to at least 3 different households. Usually 6 people who may or may not be related. Tenants involve at times children that stom, run and jump out of control. In these cases it's not just the noise is the vibration that goes through the concrete walls and even felt on my floor. It is devastating especially since I have put genie clip acoustic insulation on the ceiling of one the rooms without any beneficial effect. Also as most of these tenants are very low income (of course the landlord gets more rent collectively), the do jobs at strange hours and stay awake furing the night. The tenants change occasionally but it's always the same situation with the multiple occupation. Any ideas? I have also served section 82 but tenants change and they don't even open the door to anybody now to see if they are the same people. You can see more on HMOs and chat with Shelter via the link here as the HMO landlord may be restricted. You can also ask your local council to check if your home is registered as an HMO, see link here. In addition, and as specified in the article you could contact Environmental Health if this is a noise nuisance here. @Anon - you have not mentioned whether or not you have contacted your local council? The environmental health department has a dedicated contact for anti-social noise related issues. Some councils have a dedicated staff of Environmental Health Officers, who are able to issue warnings and on-the-spot fines to problem neighbours. Your complaint should be taken seriously. I suggest that rather than move 400 miles away, where you might even be faced with the same or a similar problem while living in a shared house, that you buy a damn good set of ear-plugs and set to getting this issue sorted out properly. I have inluded a link here. 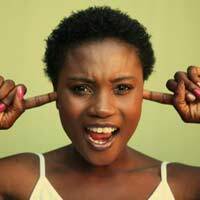 Under the Environmental Protection Act 1990, councils are obliged to take reasonable steps to investigate complaints of nuisance noise made by residents. If the local authority believes that a nuisance is present, it must serve an ‘abatement notice’ on the individual responsible. If the notices are enforced and the noise continues, fines can be issued. I hope this helps. hello,its getting not possible to live next to our neighbour.She is banging into a walls every single day and its really loud.Its really annoying,not acceptable and not normal.please do something.